The 2018 WIAA football playoffs continue Friday, Oct. 26, with Level 2 games across the state. Eight games each in seven divisions will be played this weekend with winners moving on to Level 3 state quarterfinal matchups Nov. 2. The state semifinals are Nov. 9-10 with the 2018 WIAA State Football Championships scheduled for No. 15-16 at Camp Randall Stadium in Madison, where seven division titles will be settled. When and where: Friday, Oct. 26, 7 p.m., at Beell Stadium, Marshfield. Broadcast: WDLB-AM 1450, wdlbwosq.com, and live-stream at zaleskisportsshow.com. About the Bluejays: Menasha reached Level 2 with a 41-28 win at home against Hortonville last week. The Bluejays led 27-0 midway through the second quarter on the strength of two touchdown passes and a TD run by quarterback Cole Popp. Popp added another scoring pass in the second half, and running back Riley Zirpel caught two TDs and ran for two more. About the Tigers: Quarterback Ryan Krueger tossed three first-quarter touchdown passes to push Marshfield out to a 24-0 lead as the Tigers rolled past Ashwaubenon 34-14 in a Level 1 game at home last week. The playoff win was Marshfield’s first since 2012. Marshfield also defeated Hortonville earlier this season, 41-20. When and where: Friday, Oct. 26, 7 p.m., at Ted Fritsch Field, Spencer High School. About the Blackhawks: The Heart O’North Conference runner-up Blackhawks scored a touchdown in each quarter to dispatch of Spooner 30-6 in a Level 1 game last Friday. Running back Jesse Buchli ran for 107 yards and three touchdowns, and quarterback Zach Ruf added 107 yards passing and a score in the victory. Ruf is the team’s leading rusher for the run-heavy Blackhawks with 769 yards and 15 touchdowns this season. About the Rockets: The Rockets got off to their usual hot start in last week’s Level 1 victory over Arcadia, scoring four first-half touchdowns to run out to a 26-0 lead. Spencer/Columbus went on to win 40-8 to advance to Level 2 for the fifth-straight season. Hayden Buman had 146 yards rushing and three touchdowns, Carson Hildebrandt added 112 yards on the ground and one TD, and Austin Bacon chipped in 98 yards rushing and another score for the Rockets, who rushed for 420 yards overall, and held Arcadia to 106 total yards and just four first downs. When and where: Friday, Oct. 26, 7 p.m., at Tiger Stadium, Stratford. Broadcast: WOSQ-FM 92.3 and wdlbwosq.com. About the Hornets: Colby edged Bonduel 26-20 in a Level 1 game last Friday at home, scoring three-straight touchdowns in the fourth quarter to erase a 12-7 deficit. Tyler Klement ran for 196 yards and two touchdowns, and Reece Kellnhofer added another rushing TD for the Hornets. Quarterback Roman Schmitt also hit Harley Schmelzer for a scoring pass in the victory. Colby has won three games in a row after suffering back-to-back losses to Spencer/Columbus 41-0 and Eau Claire Regis 35-7. About the Tigers: Stratford made quick work of Northland Pines in its Level 1 matchup last week at home, scoring six first-half touchdowns en route to a 41-0 victory. Okley Wrensch caught touchdown passes of 17 and 89 yards, Kade Ehirke ran for a 22-yard score, and Chase Flink had a TD reception of 23 yards, and a touchdown run of 25 yards, and a punt return for a score of 50 yards in the victory. Stratford is in the WIAA playoffs for the 27th-straight season and is in Level 2 for the ninth year in a row. The last time the Tigers did not win a playoff game was 2010, when they lost 34-7 to Colby in Level 1 action. When and where: Friday, Oct. 26, 7 p.m., at Abbotsford High School. About the Apaches: Auburndale shut out its opponents in its final two regular-season games and carried that defensive effort over to the first round of the playoffs, forcing six turnovers in a 31-16 road win at Manawa on Oct. 19. The Apaches, despite allowing 462 yards to Manawa, had two fumble recoveries and four interceptions to gut out the win. Trayton Weister had 159 yards rushing and two touchdowns, and Aaron Marth added 66 yards and two more scores for Auburndale. About the Falcons: Cloverwood Conference champion Abbotsford scored seven touchdowns in the first half to whip Northern Elite (Niagara/Goodman/Pembine) 55-22 in a Level 1 matchup last week at home. Caden Decker and Joe Aguilera each had two touchdown runs. Decker added a TD reception from Dalton Feddick, threw a touchdown pass to Ezra Kremsreiter, and returned a kickoff 75 yards for another score for the Falcons. Abbotsford has won seven games in a row, scoring 41 points or more in each, after a Week 3 nonconference loss to Marathon. When and where: Friday, Oct. 26, 7 p.m., at Loyal High School. About the Pirates: Gilman will be traveling to Loyal for the second time this month, having lost a Cloverwood Conference game there 28-11 back on Oct. 5. 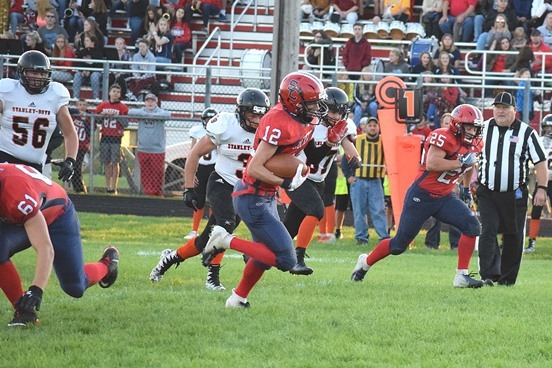 The Pirates were down 12-0 after the first quarter of their Level 1 game last week against Elmwood/Plum City before scoring eight touchdowns in the middle two quarters and won 52-24. Running back Maverick Birkenholz ran for four touchdowns and quarterback Gabe Gunderson added a pair of second-quarter scores for Gilman, as each surpassed the 100-yard mark on the ground. About the Greyhounds: Loyal trailed 16-8 early in the second quarter to Hurley in its Level 1 playoff last week before erupting with six unanswered scores in a 52-16 victory. Matt Szymanski had touchdown runs of 5, 65, 60, and 5 yards, and Buchanan and Skylar Ruggles each added touchdown runs for the Greyhounds. Szymanski was the workhorse for Loyal, rushing for 237 yards. When and where:Friday, Oct. 26, 7 p.m., at Almond-Bancroft High School. About the Panthers: Pittsville’s only loss of the season came Oct. 5 to Almond-Bancroft, 34-7, and it will get its shot at a rematch with its Central Wisconsin Conference-Small opponent in a Level 2 game Friday. Pittsville reached the second round with a 42-7 win over Wisconsin Rapids Assumption last week. The Panthers scored the final 34 points of the game after falling behind 7-6 after one quarter. Sam Hardinger threw touchdown passes of 36, 23 and 8 yards, and also returned an interception 23 yards for a score for Pittsville. Beau Merritt added 121 yards rushing and two touchdowns in the victory. About the Eagles: CWC-Small champion Almond-Bancroft crushed Wabeno/Laona 56-14 in a Level 1 game last week as the Eagles scored eight times in the first half. Jackson Beggs rushed for 240 yards and six touchdowns, and quarterback Jon Perrin added 157 yards passing and two more scores for the Eagles. Beggs, a junior, has run for 1,496 yards and 27 touchdowns this season, including 118 yards and three scores against Pittsville earlier this season. A-B has won nine-straight games since an 8-6 nonconference loss at Fall River in the opening game of the season.